What is Nueve de julio? This article was originally an email and was written by an Argentine named Carlos Mariosa to give a little history lesson to us regarding Argentina’s Independance day. Carlos is married to Karin Hosenfeld and they are currently living in Florida. I convinced my husband to put together a little something for the holiday (you have time to read it since it is a day off!) There is a little history lesson plus extra info at the end. Enjoy and Feliz Dia! What is really celebrated on the 9th of July? 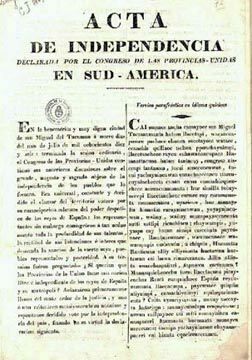 In 1816, the United Provinces of South America (Provincias Unidas de Sud-America) were ready to claim formally their independence from Spain. To achieve that, they called for a Session of Congress to be held in Tucuman. The goverment at that time was established in Buenos Aires, although Tucuman was a better venue in order to gain the confidence from the provinces, and because of their geographical position. What is the relationship between the Provincias Unidas and Argentina? It is just a matter of names. "Provincias Unidas de Sud America" was the first name used in 1810, until around 1820, when the formal adopted name was "Provincias Unidas del Rio de la Plata" (United Provinces of the River Plate). Unofficially, the name Argentina (derived from the latin name of silver -plata-, Argentum), was widely used to refer to the Provincias Unidas by 1820. It is not until 1824 though, when the country officially became a republic, that the actual name was appointed: "Republica Argentina". After that, the territory of Argentina changed mainly due to the claim of independence by Uruguay, Bolivia and Paraguay. Which provinces then formed the "Provincias Unidas de Sud-America"? The rest of the provinces didn't attend. Corrientes, Entre Rios, Santa Fe and Banda Oriental (today’s Uruguay) led by Artigas rejected to be part of the Congreso since the Assembly of 1813 had not wellcomed the latter’s Representatives due to a big struggle between their leader (or "Caudillo") and the central government of Buenos Aires. What about the rest of what today we know as Argentina? Well, the Pampas and Patagonia were considered a wild and inhospitable territory dominated by the natives, and that vast piece of land remained virgin until Rosas’ campains to the west (1840s) and Roca’s Desert Conquer (Conquista del Desierto, 1860s). The area of Chaco, Formosa and Misiones were inhospitable territory as well . What is the difference between this celebration and May 25? The heart of the "Revolution of May" occurred in Buenos Aires in 1810, in what was called the Viceroyalty of the River Plate (Virreynato del Rio de la Plata) 6 years prior to the declaration of independence. On that day, the locals decided that since Napoleon had taken over Spain, and Ferdinand VII was no longer King of Spain, the Viceroy had lost his powers to rule over this colony. After the struggle of May, the Viceroy was expulsed and the first local government took over (Primera Junta), in theory keeping their loyalty to the overthrown King. However, before that day, and even more after that, groups within the "notables" were convinced of the need of a total independence, and they wanted to go as far as possible. Most of the internal problems for the next years to come were to decide what the best fate for the Provincias Unidas would be. What led to the independence? Since the Revolution in 1810, everything was leading towards the direction of the independence. · Directorio, with differents Supreme Directors like Alvear, Posadas and Pueyrredon (all streets in Recoleta!! ), 1813 to 1820. After the Assembly of 1813, the Provincias Unidas already had a flag (the one Belgrano used with his troops, even though the First Triumvirate advised him against using it one year earlier!!! ), a currency, an anthem (the base of the one we know today), and also substantive laws like the freedom of press, abolition of slavery and noble titles, etc. By 1815 among all the provinces (including Buenos Aires) there was a sense of urgency to make this formal by declaring the independence since Ferdinand VII was back in his throne and that would definitely be a threat. Also, the Provincias Unidas had finally taken Montevideo from the Spaniards (1814) but the revolution forces were still being threatened by the regional Spaniard troops. And, of course, their own independence would give San Martin the credibility (and the official support from the government) to free the other countries and achieve his master plan that would end up reinforcing the independence (see below!!). So, a bunch of people in Tucuman claiming for the indepence made it happen? Well, of course there were a lot of battles and a lot of blood. In 1810 there were still a lot of loyal regions (and soldiers) in the Viceroyalty that didn’t tolerate the "insurrection" of Buenos Aires. Also, the Vicerroyalty of Lima, loyal to Spain, tried to advance from the north to put the things back in place. The first battles for the independence were led by Belgrano and later by Rondeau, with different degrees of success. Many historians believe that the battles were held in order to enforce the power of the Junta, but also to earn the support of the rest of the provinces, that were self ruled in most of the cases. After 1812 San Martin and Alvear appeared on scene to serve the revolutionary cause and organized the troops in a more professional way. Previous leaders like Belgrano (a lawyer) despite his success and bravery, were appointed generals simply because there was no one else who fit in the position. San Martin was convinced that the independence was going to be a reality only when Chile and Peru also were free, that is, when the Spaniards were expulsed from those their strong operation bases. He writes in a letter to one of his friends "you know my secret…. (the independence) won’t happen going North through the Alto Peru, but going first to Chile, beat them there and then sail up to Peru to give them battle from the sea". That is why he prepared his famous Andes Crossing and ended up also freeing Peru in 1817. There are still families that keep the tradition of eating Locro and/or empanadas on the 9th of July. You can even see Locro as a specialty in some restaurants that day. The following are recipes for Locro (in english), although I cannot assure you that those recipes are any good! You will have to try them yourselves. Also it is traditional that the President starts early in the morning having Hot Chocolate with some army division. When I was in the military (it was mandatory back in 1984) we had hot chocolate on May 25th and July 9th as part of the tradition (the rest of the days, Mate Cocido and yesterday’s bread). It used to be virtually (and morally) mandatory….everyone would wear a "escarapela", and if you forgot, that was a big deal. In schools, you still can see most of the kids wearing it, although the general public is not into that lately. People tend to mix Country and Goverment, therefore lack of patriotism may be related to the lack of credibility of the goverments of the last 25 years, most especially during the dirty war years. You used to also notice the flags on the balconies. But definitely you are going to see more flags when Argentina’s soccer team wins!!!! Generally, the President presides at the main celebration in Plaza de Mayo. There is always a military parade during the morning. This year, the President (as well as the parade) is going to be in Tucuman to celebrate the holiday. The parade for May 25 got cancelled due to money reasons. To see the agenda of the President, check http://www.presidencia.gov.ar/. Overall, the 9th of July was and is, more than ever, a day off. People now tend to organize minivacations or family events and take the day as they would have a weekend with two Sundays. If you would like to see the actual place where the Congreso de Tucuman took place, take a virtual tour at http://www.casaindependencia.com.ar/ (in english and spanish). Also good info here (in the case you need more!! ).